Ellen was most likely from a dairy farm that sold her to a live-market auction when she became emaciated. The feedlot she ended up at sells live animals who are slaughtered onsite. Unable to walk and too thin for slaughter, Ellen faced a bullet to the head…if not for an animal control officer who saved her life. 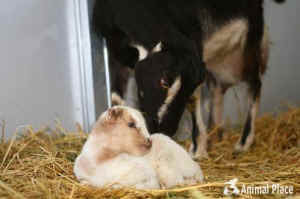 Ellen was pregnant when she arrived and gave birth to two healthy baby boys, Noah & Cornelius. She passed away recently. In the few months that I got to spend with Ellen before she died, she taught me a lot about boundaries. 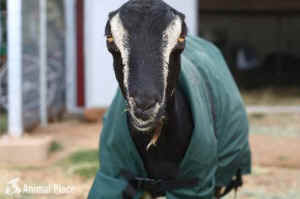 She suffered immensely as a dairy goat before coming to the sanctuary and was understandably skittish around people. Every time I would feed her in the morning, she would walk to the opposite side of her stall and not come near her food until I left. 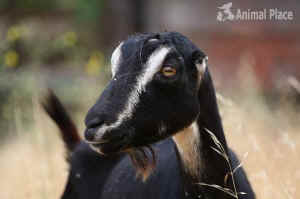 Whenever I would visit the other goats in their pasture, she would get up and walk away if I got too close to her. As time went on though, she got less scared when I opened the barn doors in the morning. Eventually I was able to actually sit down with her and scratch her neck and face. She taught me to really listen to her body language and know when she was uncomfortable with something. Looking back now I realize that all of this was possible because of one of Ellen’s best human friends, Adrienne. Through her, Ellen became less afraid of humans, and gave me the chance to get to know her personally. Ellen started getting sick about a month after I arrived at Animal Place. She had a condition called Johne’s disease. Johne’s affects every goat differently and in Ellen’s case made it almost impossible for her to eat. The caregiving team tried everything to help her get healthier but nothing worked. Knowing Ellen was in extreme pain, the decision was made for her to be euthanized. A selfish part of me didn’t want this to happen because I wanted more time with her. But I knew that if I was thinking strictly for Ellen’s well being, euthanasia was the best choice. I vowed then that I would be there with her as it happened. When I think about how her life almost ended- scared, high strung, and miserable in a slaughterhouse- I am grateful that I was there with her. We sat in the shade underneath a tree, her head on my lap, her whole body relaxed from sedation. I apologized for everything humans did to her- stripping her of her autonomy, taking her children away from her year after year, and viewing her as nothing more than a commodity to be used. I told her how strong she was and how much she inspired me. When the vet came to give her the final injection, I looked down at Ellen and told her I loved her. I gave her one final scratch on her face and kept myself composed as Ellen left this world. Her death was peaceful. She is now out of pain. Ellen was one of the strongest and most resilient beings I have ever known. She loved blackberry leaves and having the sides of her face scratched. I already miss seeing her amongst the rocks in the goat pasture, quietly observing everything that is going on around her. I am grateful she was able to experience giving birth to two beautiful boys without having them taken away from her, that she was able to make some goat and human friends, and lived the rest of her life in a safe place where she was looked at as an individual whose life mattered. Ellen did not deserve the hand that was dealt to her, no sentient being does. The transient pleasure of consuming animal products is not worth the suffering and loss it causes. Go vegan.